Written by Elizabeth Nyland of Guilty Kitchen. Fresh farm eggs: there’s nothing quite like them. What they offer more than anything else though, is food safety. Knowing where your eggs come from, what the chickens eat and how they live offers you great insight into their health status. Plus, the quality of farm fresh eggs just can’t be beat, and are a dream to work with, as my homemade mayonnaise demonstrates so well. Eating raw eggs can be dangerous as they can become contaminated with salmonella and you would never know it. Mostly this is dangerous for immune compromised people, such as young children and the elderly or ill, but they can be dangerous for anyone. 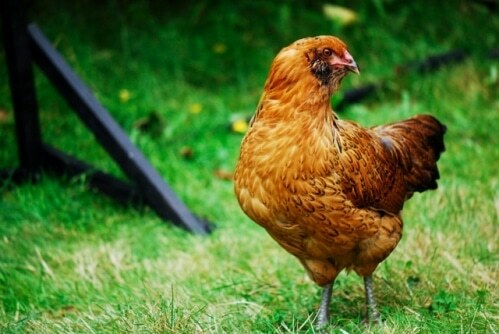 Having fresher-than-fresh eggs that come from your own backyard chickens can reduce the risk of contamination as you are the one who has handled them from nest to kitchen, but it does not eliminate the possibility of contamination, it merely reduces the risk. Not everyone has the opportunity to keep chickens, but it is easy to buy farm fresh eggs from roadside stands. An even better method would be to talk to the farmer and find out just how fresh those eggs are. Read more on ways to procure local fresh foods here. When making recipes that call for raw eggs, such as the eggnog recipe below, be sure to use the freshest eggs possible. Wash the shells before cracking to ensure nothing gets into the egg once they are removed from the shell. Having eggnog during the holidays has become a tradition dating back to when I was in high school. The first time I tried, I made four quarts and the only ones drinking it were my father and me. Good thing we liked it so much. Ever since then I’ve tried to make it every year when we have people over. This recipe is more than simple to make and keeps well as there is alcohol present (caution: don’t save it for more than a couple of days without alcohol). 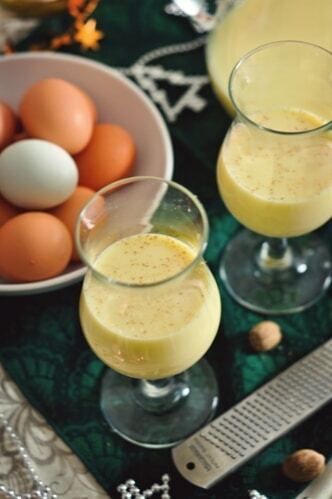 Try this recipe out and make eggnog an annual tradition in your house! We find it pairs beautifully with Pumpkin Chiffon Pie, but you can be the judge of that! Whisk yolks with sugar until creamy and sugar begins to dissolve. Add cream, milk, bourbon and rum and stir to combine. Stir in nutmeg and vanilla and chill well. Serve chilled on the rocks with a sprinkle of nutmeg if desired. I don’t use the egg whites, but it is the traditional way. To use the whites, reserve 1/4 cup of the sugar. Beat egg whites to soft peaks and then beat in sugar until stiff peaks form. In a separate bowl, beat 1/2 cup heavy cream. Fold egg whites into cream and serve on top of eggnog with a sprinkle of nutmeg. Making a danger-free eggnog is pretty easy too. Simply follow the same recipe above, but leave out the alcohol and mix only half the milk and cream into the blend, then heat the mixture in a glass or metal bowl over a pot of simmering water for about five or six minutes. Be sure to stir constantly. Refrigerate until well chilled. When ready to serve, simply stir in the remaining cream and milk, as well as the bourbon and rum. Follow the recipe as directed, omitting the alcohol and adding an extra 3/4 cup of whole milk, 3/4 cup of cream and 1-2 tablespoons of rum extract to the mix. Chill and serve. What’s your traditional Holiday drink? On her blog, Guilty Kitchen, Elizabeth writes about the joys of local food, buying sustainable and feeling much too guilty after indulging in too many rich desserts. These pics are absolutely stunning… they make me totally want to give Eggnog another chance!!! This looks so rich and yummy!! I usually drink egg nog without alcohol in it. I am thinking that is a serious mistake. I want this kind. With rum and bourbon in it!! Yum! I love eggnog but have never made it – this will be my first year attempting it. Thanks for a wonderful recipe. I’ve never had eggnog and I think I may try the cooked version! We don’t have a traditional drink around here…but usually the 21+ people have a beer or a glass of wine with Christmas dinner. I have never had eggnog but I think this year might be the year! this recipe looks delicious! Great article Elizabeth! The egg nog was just great too! Hi Liz, great recipe and my absolute favorite at this time of year. Am loving your pics as well! Only egg nog I ever tried was virgin from the carton. And I don’t even remember what I thought about it – yes, I’m posoitive it was VIRGIN…. Your recipe sounds like a great one to give it another go! I don’t really like eggnog, but I’m almost convinced to give it a try! Your homemade version sounds so much better than the store bought ones I’ve tasted over the years. I’m planning on either making this eggnog or possibly just buying a bottle of PA Dutch eggnog and bringing it to my parents’ house for Christmas. Last year, my gift to our extended families was a box of peppermint tea and a box of hot chocolate (for peppermint hot chocolate), along with a cute mug (only 5 cents from the thrift store!) and a hand-knit mug cozy. They were a big hit! I always have just one glass of eggnog each season, then I’m done. Making it sounds like such a good idea! Just picked up ingredients to make a big batch of the eggnog at my holiday cookie swap!! Can’t wait! I particularly love eggnog during the holiday season. In fact, I wish they sold it more after, but its just like most products, there is a season or time for everything, Anyways, I was going to make a quick suggestion, I use pasteurized eggs when I make eggnog at home. I mean I use them for all of my cooking needs, especially cookies, (so I can eat the dough and not worry.) But I have been following the new food safety bill and the news about the recent egg recalls , and no never can be completely positive that what you are eating is safe and good for you. I know with pasteurized eggs, I won’t have to worry when I’m sipping on my homemade eggnog. Check them out, I think they can be one of your alternatives. I’m not a an egg nog drinker but my hubs is huge on it, so I’m going to surprise him with this. That’s so fun, Naomi! I can’t stand the store bought stuff – it tastes like syrup. But homemade eggnog is magical! You may surprise yourself. There is just no comparison between homemade and store bought eggnog – once you’ve had homemade you just can’t go back!! So those who don’t think they like eggnog, try this one and I will bet you will be a convert!! Elizabeth – excellent points about eggs and food safety!!! Quick question, if we make the cooked version and also want it to be alcohol free, do we add the second half of the milk/cream and then the additional 3/4 cups of milk and cream later (when we add the extract)? So the recipe would have 1 3/4 cups cream and 1 3/4 cups whole milk total? Whoops, I meant 1 3/4 cream and 2 3/4 whole milk. Right? To make the cooked version alcohol free, I would mix up all the milk and cream, pour half into the bowl to cook the yolk sin and then finish with the other half at the end. So yes, you would have 1 3/4 cups cream and 2 3/4 cups whole milk. Add the extract at the end though, after cooking! Thanks for the help. My daughter is very excited about making this, as I have had to tell her “no, we can’t buy egg nog at the store b/c it is full of HF corn syrup” over, and over again. Definitely try this Vegan version when you get a chance! Thank you so much for the great recipe. I made it tonight on Christmas Eve and it was a huge hit. I used store eggs and did not cook them so lets hope everyone doesn’t get sick tomorrow. Great share, take care and have a marry Christmas! Well it has been a year and I am not revisiting this recipe. This is some really excellent eggnog. I have found it easier for people if I just don’t tell them that there are raw eggs in it. I’m from South Africa and the first time that I’ve heard about eggnog was on the soapy Days of our lifes. I will certainly make some. My father used to make his own creamy ice cream drink with milk,rum and vanilla ice cream. Thanx! 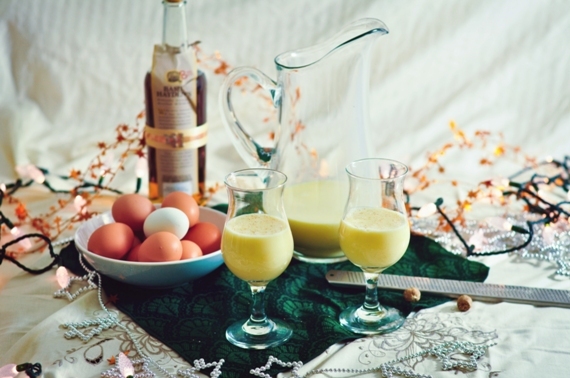 How does the egg nog differ when you add the egg whites in stead of the traditional version? never made eggnog before… just made it with my son and his girlfriend… the uncooked variation and it is THE BEST WE HAVE EVER HAD. hands down better than anything in the store. thanks for the recipe!! I have my own little ladies that provide me daily with beautiful eggs. A farm fresh egg has no comparison to store bought. Farm fresh are full flavour and colourful. I love egg nog but I Find it so sweet that I weaken it with milk. So excited to try this recipe! Excellent eggnog. We made the alcohol free version. My husband loved it and he is an eggnog connoisseur! I’m a 20 year old who has never had real eggnog before. (weird, right (and I don’t think starbucks counts..)) So glad I found this recipe. Might have to modify the alcohol part… Thank you for sharing! I’ve been making homemade egg nog for years, and this is the best recipe. Perfectly balanced with a hint of vanilla. There’s no need for the egg white topping; use those for omelets in the morning! I recommend using a smooth brandy in place of the bourbon/rum mix but that’s just my preference. Double the recipe for large groups. This is the second year I am making this eggnog! I made a double batch, cooked, since I no longer have local pastured eggs. I will leave half without alcohol so the children can enjoy it too! Two big jars are chilling now! Note: to cook a double batch it took me about 9 minutes to reach the safe temperature (160 F) that a single batch could reach in five minutes. I looked up the temperature here: http://www.foodsafety.gov/blog/eggnog.html.